I will leave the city of Kpalime and probably take a Moto to the city of Adeta, Togo or somewhere close to there, I am guessing it is about 30 Kilometers or about 18 miles. This is a very short distance; however, I hope it is full of small mountains and a winding jungle cool road. I am going towards the mountains to buy time until it starts to rain, to cool off the Hotel rooms. There is very little Jungle in West Africa like you think of in the moives. I made a mistake on the map, oops, too late now, I just cannnot see them, my brain does not focus in that method. This is a map of my route between Cell Phone Cells or Antennas. I have fours maps I am using. 1. Encarta Encyclopedia on the computer. 3. 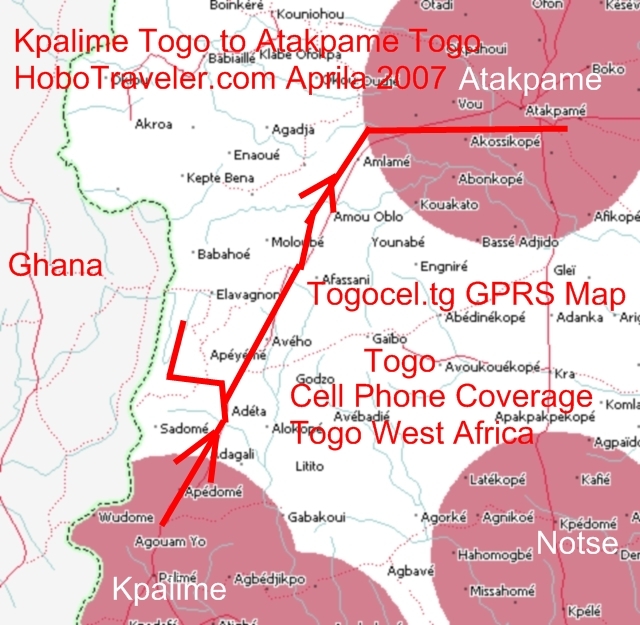 GsmWorld.com Togocel.tg cell phone map, the one above. 4. Carte Routiere Et Touristique - A paper map, purchased in a bookstore for 5000 CFA. I would say the Carte Routiere et Touristique is the best, and seems to have the proper size of the city names, to coordinate with the size of the real cities. Richard Trillo of the Roughguides.com recommended the Michelin Map and I really did not have time to buy in the USA before leaving. I do not know if it was in English or French. I prefer French because it is the language of business here. My Encarta Encyclopedia is handy, easy to use, however the cities, roads and what is big or small is always suspect. The guidebook tends to keep with the main cities mentioned in the guidebook and guides. I not so fond of tourist, therefore I like to leave the guidebook routes and travel different. What is really a benefit of this map from Togo or the paper map is all the symbols, the Hippos, the Cacao, the Teak, the various symbols to help me leave the normal tourist routes and wonder around Togo. I normally do not prepare much to go to a country, I try to snag a guidebook for hotels, but the other information and ideas, I learn or pick up along the way. I sort of call this the sport of travel, if everything is planned and figured out, then where is the sport.